The Nationwide football annual is now 125 years old - a remarkable achievement for the world\'s oldest football book. And it is still the best value soccer yearbook in the market, living up to its billing as \'soccer\'s pocket encyclopedia\'. As usual the book is packed full of information vital for the football fan; from team line-ups to international results; from international appearances and goalscorers to the sort of trivia to keep a pub quiz in questions for another 125 years! The book contains everything anyone needs to know about the game -- league and non-league -- in Britain, Ireland and throughout Europe. The publication of the latest edition of the annual is always a major event in the soccer calendar. 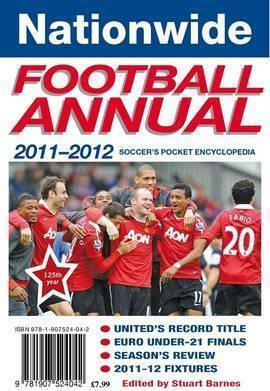 Included are: results from the 2010/2011 season (including domestic and European cup competitions and international matches involving British teams); full fixture lists for the 2012/2013 season; all major European and world football awards; a day-by-day diary highlighting the season\'s biggest stories; players and their appearances for each and every league club.